A special request episode from your Do Over listener Cy Cawthorn. Matt responds to Cy’s inquiry with regard to “How To Attract the Right People to Your Do Over.” To submit an episode request, please do so at https://www.facebook.com/DoOverGuru. Download the 3 Pillars of Creating the Ultimate Do Over at https://FreeDoOver.com. Matt: Hey, this is Matt, “The Do Over Guy,” and this is Your Do Over: Episode 46. Okay. I’m very excited about the next few episodes, as I’ve received some special requests n my FaceBook page. If you want to head over there, you can find me at FaceBook.com/DoOverGuru. I’m still waiting for Facebook to allow to change oyur name on your FaceBook page. If you are curious, I’ve created that page before I ever had a podcast and my book was ever released. You know, I don’t want to be the Do Over Guru. It was an accident. They won’t let me change it though. Then you know, when somebody else, I don’t have an idea who, they went to register the Do Over Guy on FaceBook. They even post and respond on my behalf. I mean that was kind of weird. They my picture up there and every thing. I suppose I’m fortunate, though, they are fans and that they haven’t done anything to harm my reputation but either way, I’m on FaceBook.com/DoOverGuru. The Do Over Guy on Facebook, although it is my picture, it’s not me. Alright. Today’s request comes from Cy Hawthorn. If you ever request, by the way, or have a question about a past peisode, you can head over to the same Facebook page and share with me. No promises but I’ll do what I can. But today’s request comes from Cy Cawthorn, coincidentally I spoke to Cy on the phone this week. But Cy wrote, hey , Matt. In the interview with Steven Greg, you asked him, what technology has helped the most. He gave two answers and the second one intrigued me greatly. He said, he’s learned how to attract the right people to delegate certain tasks to. How about a Top 10 on How to Build the Right Team For Your Biz Do Over? So uh, I’m scratching my head. I thought it was a very good suggestion. I said, well, I can certainly come up with two or three of how I think I’ve attracted the right people and I wrote down those three. I came up with the fourth. I came up with the fifth. I actually ended up with a list of 10. So Cy, you’re in luck. Here’s the Top 10 on How to Build the Right Team For Your Biz Do Over. Let’s get into this. Alright? Before we get to the tips, however, what you’re going to want to do is that you’re going to want to define right people. Who are the right people for you? you see, once you do this, once you take some time to actually who that person is. What’s going to happen is going to turn on your reticular activator that part of the brain responsible for awareness. You see, once you’ve turned that on. You’re going to begin to recognize the right people when they do cross your path. For example, if you don’t know what that is. You don’t have any experience or reference. Think about the last time you bought a new car. You know, the day before maybe you didn’t know which car you’re going to buy. You didn’t even really know that car existed. But once you bought that car, you drove it to the lot, you noticed that car every where. It seems like everybody had one. Right? That was your reticular activator working for you. so when we need to turn that on? We turn that on by defining the right people. Okay? So before any of the tips will apply, first, define who are the right people to you. define their character traits. Define their resources. define their strengths. Maybe their personality types and perhaps their geographic location. Get this details as you possibly can because you’re already there. They’re already in your life. But because you don’t necessarily exactly what they look like, you’re not seeing them. Okay? So number one, tip number one for attracting the right people for your Do Over. Have a vision. That’s number one. You got to have a vision. You have to know what you want. It’s so important to have a vision to have clarity around where you’re headed. I mean you’ve heard me say this before, if you don’t know where you’re going, if you don’t have a plan and if you don’t have an idea of where you want to end up. Any road is going to get you thee. You see, the more clear that you are about what you want and the more committed you are to that vision. The more people are going to be attracted to you. The more people are going to follow you. The more people you are actually going to inspire. People, the right people will follow those that have a clear vision of which they too believe in. Unfortunately, it’s because so few people have visions of their own. So tip number one, you want to be a leader with a vision. If you are a leader, you will attract the right people. Number two, get out of the house. You got to get out of the house amongst the people. You got to get out of the house if you ever expect to attract the right people. I mean face it, regardless of the business that you’re in, regardless of the business that you do, whether you’re on the selling side or the buying side, you’re going to have to interact with people to get it done. If you happen to be even involved in a home-based business, it’s just that home-based business. Don’t get it confused with a home-bound business. You know what I mean? All of your possibility and all of your dream, it lives amongst the people. Conversely it dies without people. It dies without a community. It dies without a group. It dies without a network. So if you want to attract the right people, you must be amongst people. Pretty simple but it’s so simple that a lot of people fail to recognize this. You don’t want to be one of the people sitting in your house, wondering why nothing ever happens for you. or hwy no one will help or why no one thinks like you or like no one wants to do it and partner with you. It’s because you got to be amongst the people. They might not be in your house. Okay? For the most cases, they’re not in your house. Number three, you want to share with others what you’re up to in life. Don’t be stingy with your vision. Don’t be stingy with your ambition. Don’t be stingy with your goals. Share your vision with anyone that asks. Share your vision on a platform is presented or when any platform is ever presented. I mean, in fact, if you’re not publicly speaking every chance that you get. That could be a boardroom of your peers or that could be to an auditorium of thousands or anywhere in between. You’re missing one of the biggest pupil attractors that I know of. I mean just by assuming of the role of publicly speaking or speaking in front of a group whether big or small or medium. It doesn’t matter. Just by assuming that role, it’s almost automatic that you’re interpreted as an authority or even as an expert of you will. If not that, if you’ll be interpreted at the very least a courageous person. You see it takes courage to stand up and speak in front of people. Just the thought of that terrifies most people. If you stand up and speak in any opportunity that you have, it displays courage indirectly and inadvertently. People are attracted to courage. The timid are attracted to courage and courageous people themselves are attracted to courage. As your possibility in your dream lives amongst people inside of a community, the manifestation of these possibilities and dreams stand in your communication amongst the people. So possibility, it dies without communication. This is a biggie. It is a biggie that you got to understand. It’s a big one that you need to get and embrace. So what and how do you communicate? First, what do you share? Well you got to be communicating your vision. As I mentioned, you must be clear with that vision so you can communicate that vision clearly. It might take some practice. In fact, I recommend that you practice it. In fact, I don’t even recommend it. You must practice communicating it. You got to practice communicating it in a way that inspires people. So how do you do that? You want to be able to communicate your vision in a way that people see something possible for themselves inside of your sharing, inside of your communication. So when you’re talking about your vision if someone can see something for themselves inside of your sharing of that vision, that inspires people. Second, how do you share it? Well as I’ve mentioned, you’re going to want to practice but I’m going to give you a structure from where you can begin. It’s been referred to as an elevator pitch most commonly referenced. Most people are terrible at their elevator pitch. They’re absolutely terrible. They try to wing it. They don’t practice it. I mean attend any networking event and you’ll see how terrible people are in conveying their vision, how terrible they are in conveying their mission, or conveying their purpose or conveying their product or their service or whatever they’re up to. People are terrible at it so practice yours. Because if you practice yours and you get good in conveying your vision, you’ll stand out so far above the crowd that people, the right people, won’t be able to help themselves wanting to hear more. The right people won’t be able to help themselves in following you and wanting to hear more. So your elevator pitch. I have a very basic formula where you can begin crafting yours. Having said that, this might be all that you need. You might not even think any other of this basic structure. Certainly, its all that I use. The person that taught it to me referred to it as an audio business card or ABC if you will. I refer to it as the magic sentence. I referred it to as that because it is just that sometimes. It almost performs magic. It’s one simple sentence that lamost magically attracts the right people to you. Conversely, it will help sort the people that might not be so right. So it works on both ways. Okay? What you’re going to want to do, break out your white paper and blue ink. I want you to write this down. If you’re driving or if you’re on the treadmill or jogging or whatever it may be, make sure you do this when you get home. But if you got white paper and some blue ink handy, you’re going to want to grab that. Why white paper and blue ink? Well studies have shown that combination of white paper and blue ink will increase your memory retention by 30% or 40%. I don’t know if that’s true or not but I certainly don’t want to increase or end up losing and end up forgetting thing. Okay? So get your white paper and blue ink. First, write I or the letter I then print the C. write action verb. You got “I” then action verb. An action verb can be a show or train or coach or mentor or administer or teach or facilitate. Those are all action verbs so it’s I action verb then imprint the C add target market. Okay? So I action verb target market. Your target market can be any category of people likely it will be the people that you’re looking to attract of course. So if you’re looking to attract small business owners, small business owners would be the category of people that insert into that formula. Or maybe it’s school teachers or maybe it’s firefighters or maybe it’s people who want more out of life. Your audio business card could easily be very start like “I show people who want more out of life.” Blah, blah, blah. Okay? So you have I show being the action verb and people who want more out of life is your target market. Okay? So now that category can be anything that you could think of. That’s why it’s very important as I mentioned in the beginning is to identify who the right person is that you’re looking for. Identify the people that you want to attract and come up with a description of that category that you insert into the formula. The one I always use is busy professionals. I show busy professionals a real estate portfolio. That’s how mine starts. I show action verb. My target market is busy professionals. Now I show them how to build a real estate portfolio. That leads us to the next part of the formula. Right now you have I, action verb, target market. Next part of the formula is benefit. Okay? Put the word “benefit” in parentheses. So you have I, action verb, target market, benefit. This is going to be benefit of what you offer. If you provide financial service, the benefit might be securing financial future. I show people how to secure financial future. Or if you provide book keeping services, the benefit might be I bring clarity to one’s financial records or I bring clarity to people’s financial records. Or I bring clarity to people’s financial record. I bring clarity to school teachers’ financial records. That’s the first half. Okay? So as I mentioned the benefit of what I do is to build a real estate portfolio for people specifically in their spare time so my audio business card that I use all the time goes like this, I show busy professionals how to build a real estate portfolio in their spare time. The next part is so they can. That’s the next piece of the formula so they can. Then end it with another benefit. This will be a more personal benefit. The personal benefit that your professional benefit provides. For example, if you’re in the financial services, you may show people who to secure their financial future as I’ve mentioned. I show people how to secure their financial future so they can sleep better at night being more of a personal benefit from your professional benefit. So here it is, write this down. I (action verb) (target market) (benefit) so they can (benefit). This is what some examples might sound like. I teach small business owners how to leverage their relationship so they can create a second stream of income that is going to attract the right people to me. I mentor aspiring investors on how to minimize risks and maximize returns so they can vacation with their spouse. It’s very specific on who I’m looking for. If I happen to be talking to the person that I’m saying this to and I happen to be that person, they’re going to be very interested on what I am going to say. The possibilities are endless. You can keep on mixing and matching different words inside of that formula but it takes some practice. 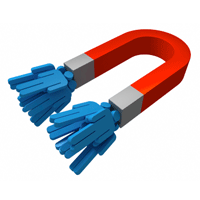 But it’s extremely effective and attracting the right people to you. So for example, here’s mine. Anytime, anyone asks me what I do, I show busy professionals how to create passive income in their spare time through real estate so they can enjoy the good life. Now as you’re listening to that either that’s going to resonate with you or it doesn’t. I’m only looking for the people of which it does resonates with. If it does, you’ll want to go to a new website that I just put up. GrubAndGrowRich.com. . GrubAndGrowRich.com. I just put up this website. The right people I want to meet will go there to see what it’s all about. I am attracting the right people through a combination of everything that I’ve discussed this far. One, I have a vision. Two, I’m among the people. I mean you’re listening to me right now. I just have a different medium of getting amongst the people but I go out. I’m a networker. I go to clubs. I go to meet-ups. I go all over the place to meet people. And three, I’m sharing with you what I’m up to in life. I’m sharing with you my vision. Those first three steps are critical. That’s why I put them first. I know when I share my audio business card with you, I show busy professionals how to create passive income through real estate in their spare time so they can enjoy the good life. I already know that I’m attracting the right person and the right people will go to this new website that I just put up, .GrubAndGrowRich.com. GrubAndGrowRich.com. Only the right people will go. I mean if you have no interest in building passive income through real estate, you’re not going to go there. That’s okay. Because we are probably not going to be a good fit for each other. That’s what that audio business card does. It’s the right people by being very clear on who you are looking for. Getting out amongst the people and sharing with those people is going to attract them to you. some are going to be attracted to it. Some will not be. That’s perfectly okay. Alright? That brings us to number four of how to attract the right people. Number four, you’ve got to detach yourself from the outcome. Detach yourself from the outcome. The fastest path to failure is trying to please everybody so don’t try. You’re not going to be able to do it. It’s a painful lesson futility. It’s going to be frustrating. You never will please everybody. You’re not going to please them all. So share your vision in the exact way as you see it. Don’t try to shape it for anybody else. Share it in a way that you see it. Share in the exact way as you feel it. Don’t share it in a way that you think that you’re talking to might feel it. Share it in a way that you feel it then the right people will be attracted to it. The people that are not, let htem go. It’s okay. You can still be friends. So detach yourself from the outcome. Number five, be the change you want to see in the world. now this is a very famous quote from Muhatma Gandhi, be the change that you want to see in the world. I think it’s extremely important to attracting the right people into your life. Like attracts like that is the essence of the law of attraction. Like attracts like. If there are certain types of people you want to attract into your life or into your business, be the change that you want to see in the world and the people that want to see the change will be attracted to you. Here’s what I mean, if you want more compassion in the world, you’ll attract compassion in the world. You’ll attract at people and you’ll inspire others to be more compassionate and they too will be attracted to you. If you believe the world needs more entrepreneurs as I do, be the best entrepreneur you can be. You’ll attract more entrepreneurs and you’ll inspire others to be entrepreneurs and they’ll be attracted to you also. If you think the world needs more open-minded self motivated people, be open minded and self motivated yourself. You’ll attract open minded and self motivated people. You’ll inspire others to be more open-minded and take action themselves. That brings us to number 6, stay in action. Wealth, abundance, prosperity are attracted to movement. You know, just nothing is going to happen until something moves including attraction. They say a rolling stone gathers no moss. Right? You want to stay clean. You want to stay in action. Just as with people are attracted to people with clear vision is well they are attracted to people to take action. Having a clear vision, sharing that vision, and taking action on that vision requires courage. We talked about courage. Because so many people sadly lack courage, they are attracted to people that have it as well courageous people are attracted to courageous people. Again, like attracts like. Courageous and open-minded people that take action want to do business with other courageous and open-minded people. So be courageous and stay in action. Be courageous around your actions. Number 7, help others get what they want. Help others what they want. It’s a concept expressed countless over the years by Zig Ziglar. If you help enough people to get what they want, you will get what you want. You can do that through a product that people want. You can do that through a service that people want or you can do that whenever you see an opportunity just to lend a helping hand whether that’s a friend or a family member or a co-worker maybe a complete stranger. Here’s my favorite and is actually number 8: volunteer. Volunteer will attract the right people for you. You see, when you’re volunteering you are showing as a best you that you can be. When you’re volunteering authentically and honestly, you are showing the best you can be. When you are showing the best you, you will attract people like the best you. further, volunteering is a great way to network with people you otherwise might not ever meet. I mean it’s just your past might not have ever cross because of what you do and where you do it, or how you do it. You see, by volunteering and working with non-profits, you will frequently get the opportunity to meet the most amazing people. That’s from the people doing the heavy lifting, the ground soldiers if you will. To the people heading the organization or the people managing the organization all the way up to the celebrities and the affluent that endorse and champoion those non-profit organization. So volunteering that’s going to create some amazing attraction possibilities for you. Number 9, don’t judge people. You know that kind of goes without saying but sadly we all do it I mean we can’t help it. We all try to judge a book by its cover even though we’re told not to. We’re told do not judge a book by its cover but inside our head we still do it. You know, sadly, countless opportunity are missed every single day because people pre-judge. There’s not a whole lot more that I need to say about this other than get to know people. Here’s a tip that I receive from Earl Nightingale, “treat every person that you come in contact like they’re the most important person in the world.” First, I mean it’s how people should treat each other right. That’s how people should treat other people. Second, people are attracted to people that show an interest in them. People like people that like them. So be open and get to know your fellow men before you pass judgment. Even then be really, really careful. You know as my father raised me with the idea of don’t believe in anything that you hear and only half of what you see. I think those are wise words in the proper context. Number 10, be your word. Be your word. It’s actually my favorite. You know, tips from one through nine, they can and will attract the right people to you quickly. Those are tips you can implement right now and experience instant results but if you want to continue to attract the right people to you over the long term. I can’t think of anything more powerful in attracting the right people to you than integrity being your word. There’s a very simple application for this. There is very simple way to apply this to take this concept of being word and putting it into action then incorporate it into your life. Get in the habit of saying what you’re going to do. Get in the habit of saying what you’re to do before you do it. Share it and declare it to anyone that will listen. You know if you want to climb a mountain and kill a Manjaro this coming next vacation, start sharing it. Start declaring it. If you want to be the number one salesperson in your organization, start sharing and declaring it that that’s what you’re up to. You want to get into habit of saying what you’re going to do then you want to do what you say. You want to do what you say without reasons. You want to do what you say without excuses. You want to do what you say for no other reason than because you said so. That’s being your word. In my opinion, that’s a mark of greatness. You know, John F. Kennedy declared that we would put a man on the moon before we even had the technology to do it. He declared it before the world. When he didn’t even know how it was going to happen, he followed through because he had declared it. I think in 7 or 8 years after John F. Kennedy died, we landed on the moon because he declared it. Gandhi, he declared that there’s going to be a free India. He declared that there would be a free India. Nothing but saying what he was going to do then doing what he said. He was just one man. He had no idea how he was going to make it happen. He didn’t have an army behind him. He was one-man that declared what he was going to do and then he did it. He was his word. Then Mark Luther Jr., he increased the awareness the civil awareness of his country to the point where every human, every race, creed, and color has him to thank for their lives right now. The lives that they live today because of what he did because of what he did. He did it with his word. Your word being your word is the most powerful attractor of the right people that you have. You know what? It’s yours. You already have it. You own your word. You own your word free and clear. It’s extremely powerful. You got to have respect for your word. Be your word as JFK, Gandhi, and Martin Luther Jr. were. You won’t even have to worry about attracting the right people in your life because they will be there. People give their loyalty. They give their hand. They give their business to those of integrity and honesty. It begins with and exists in saying what you’re going to do then doing what you say. So there you have it. The top 10 to attract the right people into your Do Over. That’s it for today. Next episode, I got another listener request coming from Tony Tosco. Tony, the next episode is for you, buddy. It’s going to be a good one. Until next time. God loves and so do I. With him, all things are possible.